what other instruments do you play? right now i play cello and drums. ive played the cello for about 7 years for school. and the drums about 4 years. i'm fiddling around with a cajon myself along with the ukulele. Hey, I picked up a snare cajon myself about a year ago. They're great, aren't they? Since then I've added a hi-hat and a small boom attachment for a splash. Sounds like a little drum kit. Great for acoustic gigs. Not too loud but loud enuff. I primarily play the ukulele, but in addition to that I play the drums. . .a full drum set, as well a cajon to be specific. Why does your guitar only have four strings? See what had happend was. . .
Their was this dragon right, and the unicorn was standing in the corner. . .and a camel fell from the sky and landed on my guitar! ! ! And that's why my guitar only has four strings. ive always wanted a cajon from what ive seen it looks pretty beastly. im not the best drummer, but i can hold a time (more or less). Let's see... I play ukulele, guitar, drums, a little bass, and a little bit of piano though most of it's forgotten. I forgot alot about the piano because I haven't really played since I was like 7. I play the violin (But I'm thinking of maybe switching to viola), bass, and I dabble a little in piano. We're doing musical instruments in French and German, so we had to look up ukulele. 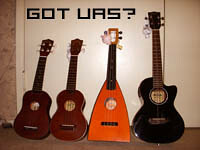 I insisted to know :P By the way, it's un ukul&#233;l&#233; (French) and eine ukulele (German).